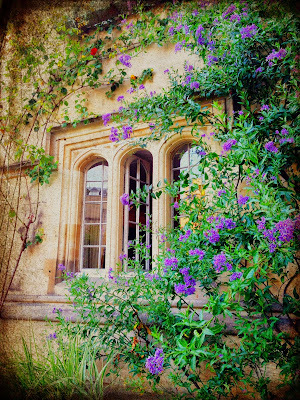 Steve and I have always loved the Oxford Botanic Garden, and I’ve subjected you to many photos of it over the years. Can you bear with me once again? And perhaps help me with flower names? Above you see beautiful pinky purple flowers (I never pay attention to labels, argh) with Magdalen tower in the distance. This is my favorite doorway in the garden wall — I tend to take a photo of it every year. A gorgeous burst of red by a window — wouldn’t it be lovely to have an office with such a view? I love this riot of color! There are poppies in there, but what else? And what are the blue flowers? Methinks I need to find a guide to English flora . . . This entry was posted in Traveling and tagged England, Oxford, photos, postcards, travel on July 14, 2015 by SoniaG. We returned from Lyme Regis yesterday, but I’ll save those details for a post later this week. 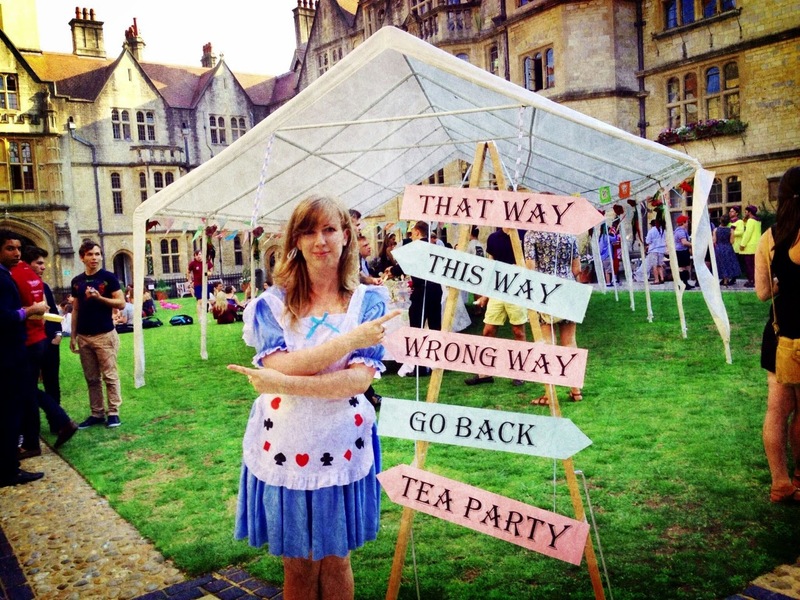 For now I want to share photos from last Wednesday when the clever Brasenose conference organizers put together a Mad Hatter Tea Party for all the conference groups. Attendees were encouraged to dress up in their maddest hats, or in pretty much anything related to Alice in Wonderland. 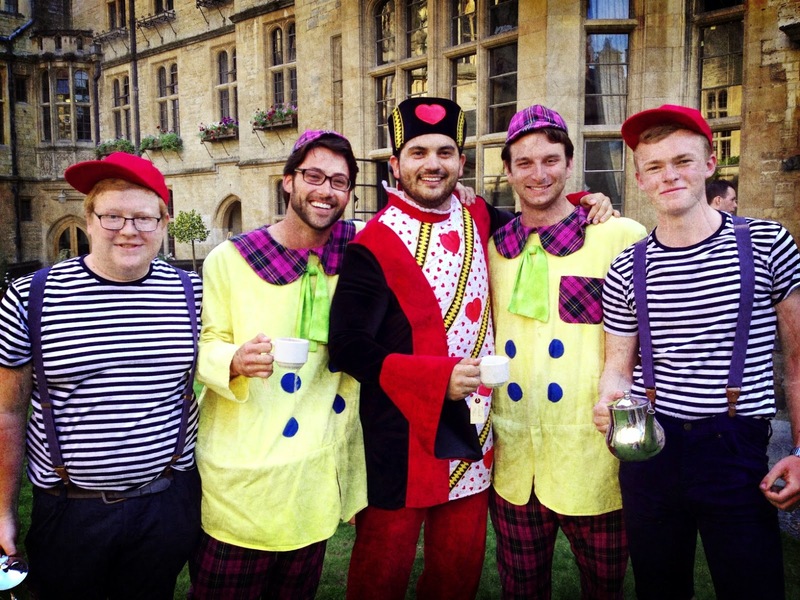 A few of our students (shown here with members of the Brasenose crew on either end) took this as a challenge. But I was even more impressed by the amazing treats! No matter which way you turned, there was something fun and/or delicious to tempt you. 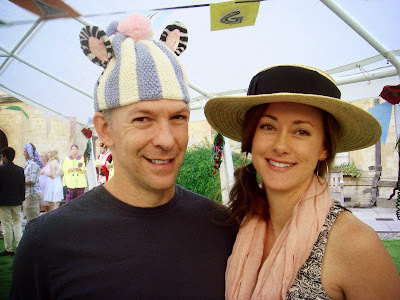 My hat was not very “mad” at all, but Steve got as creative as he could at the last moment. The ears are part of a zebra headband from Claire’s (yes, they have those little jewelry/accessories stores here, too). Can you guess what the blue and white knitted part is? Because it certainly wasn’t meant to be a hat! 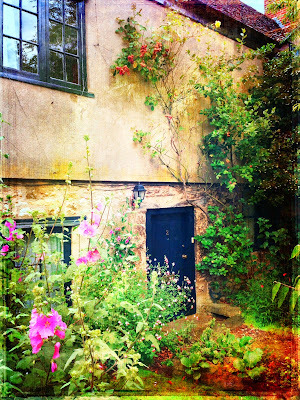 This entry was posted in Traveling and tagged Oxford, photos, postcards on July 28, 2014 by SoniaG. For our anniversary weekend (23 years! ), Steve and I will spend three nights in London. 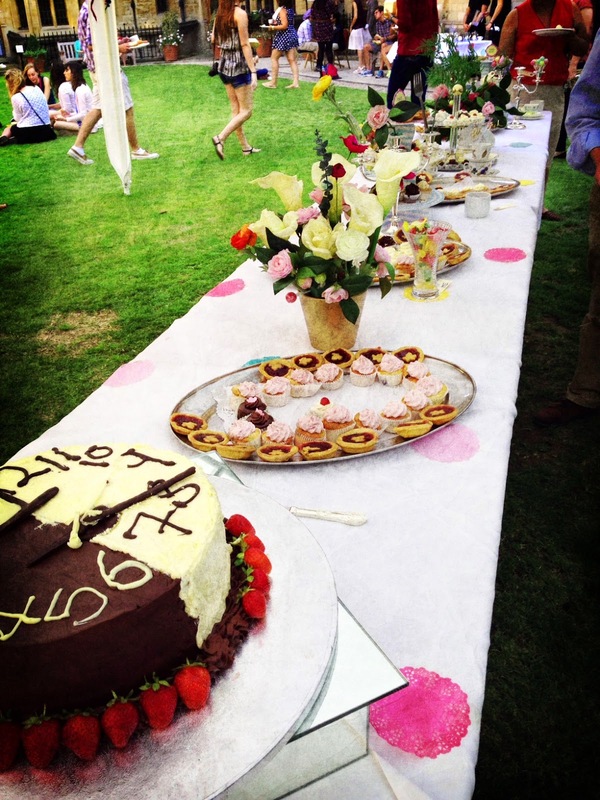 There will be theatre, a concert, and at least one full afternoon tea. Many postcards to come! And here’s a photo of the folks in our summer law program at Brasenose (excluding two students, a faculty member, and moi.) A fine looking bunch, don’t you think? 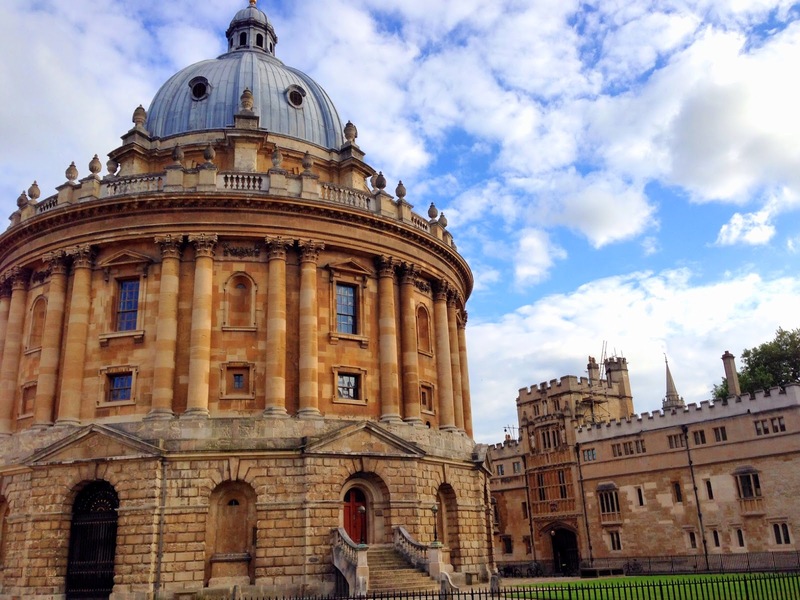 This entry was posted in Traveling and tagged Oxford, photos, travel on July 17, 2014 by SoniaG. 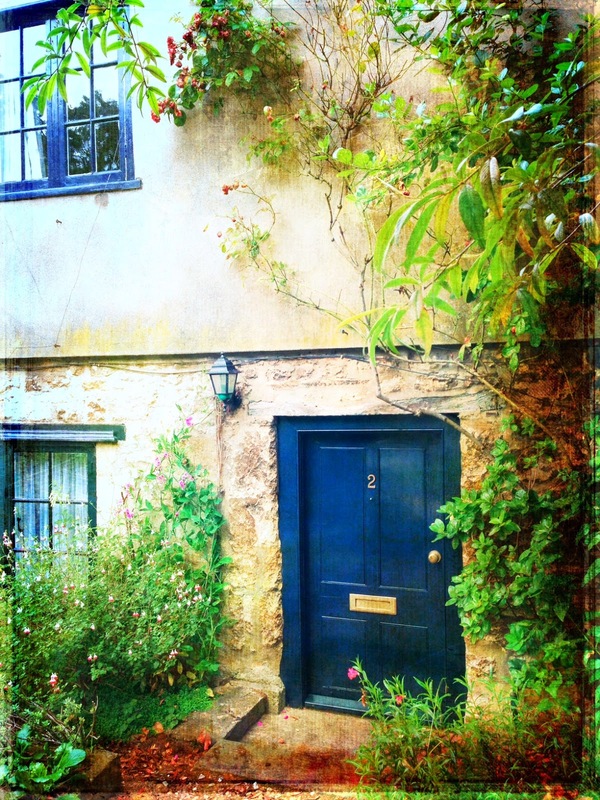 Every time I walk along Parks Road, I wonder about this small blue door. The building is on the grounds of Wadham College, but I can’t seem to find any information about its history or current use. Was the door used for deliveries only? A closer view of the door. Any insights? Before the concert began, I just couldn’t resist taking a photo of this window outside the chapel door. Isn’t it so very Oxford? A few seconds after I took this, a man came to the window and gave me a dirty look. Needless to say, I scurried off. Yesterday we enjoyed a concert at the Holywell Music Room, and I was delighted to see Edward Petherbridge in the audience! 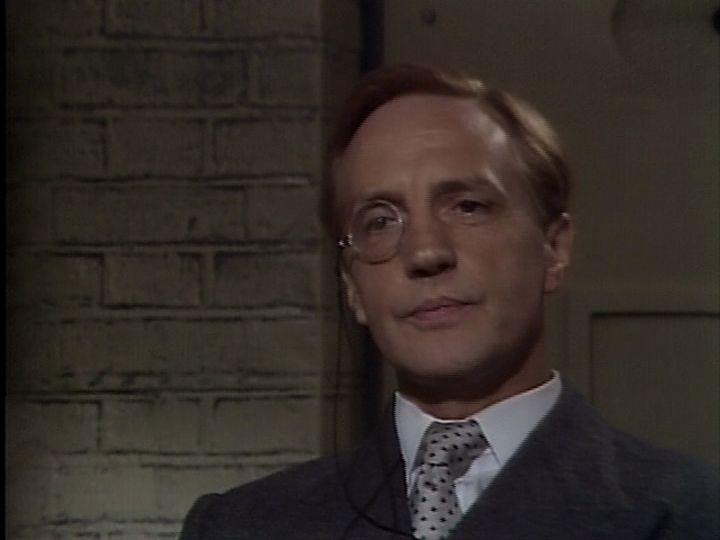 (He will always be Lord Peter Wimsey in my mind and heart.) I waited after the concert to see if I’d get a chance to talk to him, but he looked tired and shy — as though he really just wanted to be left alone — so I didn’t push the matter. It was nice enough to have seen him in person. 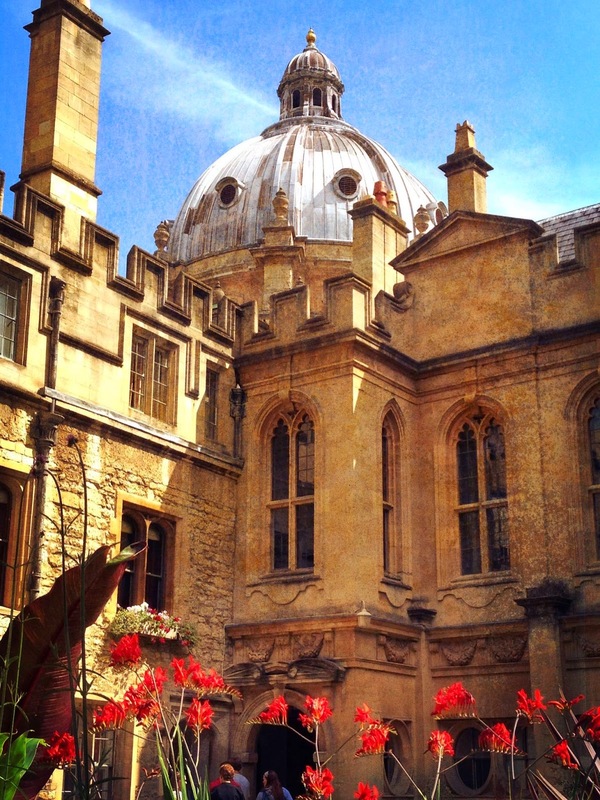 This entry was posted in Traveling and tagged music, Oxford, photos, postcards, travel on July 14, 2014 by SoniaG. 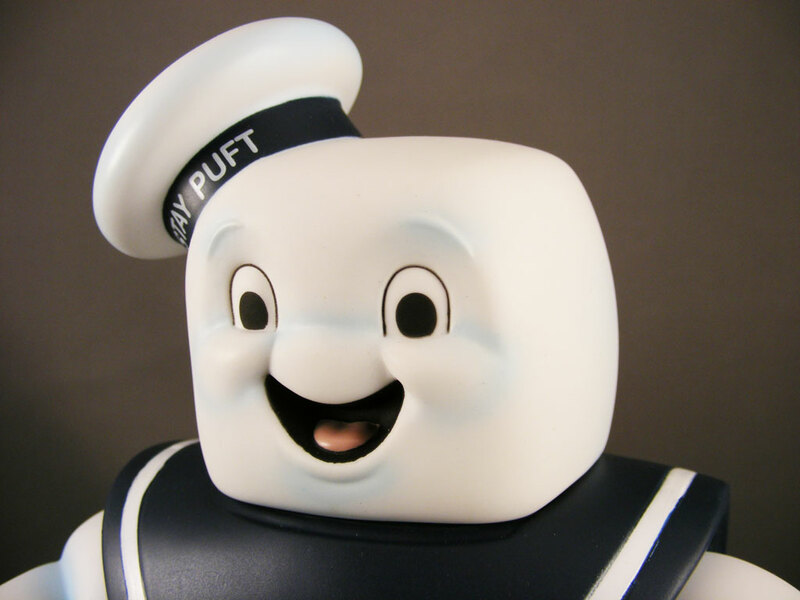 I love seeing the dome of the Radcliffe Camera when walking through the Deer Park and Old Quad of Brasenose College, but this is the first time it’s seemed like a face peering over the wall — am I the only one who thinks this face vaguely resembles the Stay Puft Marshmallow Man? Yesterday was rather cold and wet, but today the sun is shining. I’m looking forward to dinner at The Trout with the Oklahoma alums who currently are enjoying the Oxford Experience, but first I really need to get serious about the work I brought with me . . .
Or maybe I’ll take a walk with Steve. It’s just too gorgeous outside! This entry was posted in Traveling and tagged Oxford, photos, postcards, travel on July 9, 2014 by SoniaG.